You passed the Ham Cram, got your amateur radio (ham) license, and purchased a Baofeng UV5RA dualband handheld radio. There are countless times when radio is needed but its not fully charged. Dont get stuck off air simply because the chargable battery goes dead, and you can get AA size batteries anywhere. This probably will cost same what radio costs but the stock rubber duck antenna delivered with radio usually will not radiate enough and also has very poor reception. If you cant reach other stations, then why have radio in first place. 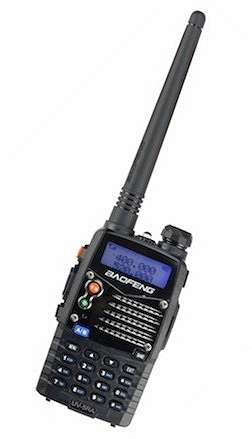 Important Note: Baofeng radios use reverse SMA, typical antennas are standard SMA and will not mate to radio. Antennas below are designed to mate with the Baofeng. Very important not the straight fixed adapter but something of a few inches of coax to prevent accidental breaking of antenna connector on radio. Another important aspect is this is a reverse SMA mate to the Baofeng radio. Antenna on the roof will give your little handheld a huge boost in coverage like power of a mobile radio. Thanks to Richard Mogford for finding the following sites. Print a hardcopy and have it handy.